Japanese carmaker Toyota has announced that it will suspend sales in the US of one of its luxury vehicles. The move came after a US consumer organisation warned customers not to buy the Lexus GX 460 four-wheel drive because of fears it could roll over. The last time it judged a vehicle's performance unacceptable was in 2001. Toyota said it remained confident that the vehicle was safe, but would suspend its sale to identify and correct the safety issues identified. The carmaker has recalled over eight million cars globally due to safety fears over faulty accelerators, floor pedals that stuck in mats and braking issues. Consumer Reports said it had judged the Lexus GX 460 a "Don't Buy: Safety Risk" because of a problem experienced during its standard emergency-handling tests. "When pushed to its limits on our track's handling course, the rear of the GX we bought slid out until the vehicle was almost sideways before the electronic stability control system was able to regain control," it said. "We believe that in real-world driving, that situation could lead to a rollover accident, which could cause serious injury or death." However, it also said that it was not aware of any such reported incidents. 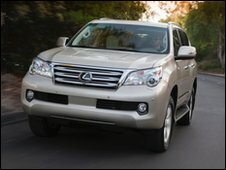 The GX 460 has been on sale for about three months in the US and, according to the consumer group, about 5,000 vehicles have been sold. Toyota said in a statement: "Our engineers conduct similar tests and we feel these procedures provide a good indication of how our vehicles will perform in the real-world. "However, we will try to duplicate the Consumer Reports' test to determine if appropriate steps need to be taken." Paul Eisenstein, publisher of the automotive industry website the DetroitBureau.com, told the BBC World Service it was another setback for Toyota. "Every time they seem to get a grip on the safety scandal that started last October something seems to pop up," he said. Toyota is currently facing a record $16.4m (£10.7m) fine from the US Transport Department for failing to notify it about defective accelerator pedals. The company must decide by the end of this week whether to challenge the fine.